WICHITA, KS.—The two-game win streak for the Tulsa Oilers ended on Wednesday night when Thunder goaltender Tim Boron made 27 saves to lead his team to a 2-0 decision. Alex Bourret and Todd Hosmer were the heroes for the Thunder, who used a 5-on-3 early on in the second period to secure their first goal from Bourret at the 7:05 mark to give the home side the lead, and in the third period Hosmer managed to have his puck squirt through the pads of Oilers goalie Kevin Carr to put in the game winner for Wichita at 9:05. 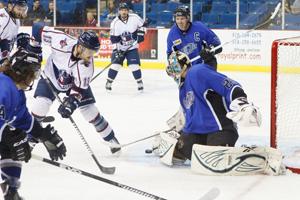 Tulsa had a few quality chances, but Boron had the cage closed for Wichita tonight. Boron was tested early and made a terrific save on Adam Pleskach, who came down on a breakaway to only see his wrist shot denied. Tom Mele almost caught Boron out of the net on a wrap-around opportunity, but Boron somehow got back and kept the game scoreless. Wichita maintained the 1-0 edge into the third period and Boron made perhaps his biggest stop of the night in the early stages of the final frame. Oilers forward Charles Lachance moved in on a breakaway but was thwarted by Boron at close range. Other than that, Adam Pleskach led the Oilers with six shots on goal in the game. The Oilers went o-for-2 on the man advantage and Wichita went 1-for-3. The Oilers now move to a 2-1-0 record in the ECHL Central Division. 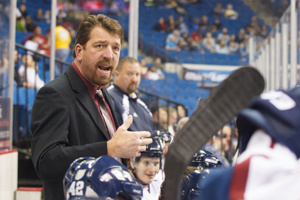 They return home on Friday night for their first meeting with the Missouri Mavericks, a team that went undefeated against the Oilers last season. Faceoff is slated for 7:35pm in the BOK Center. They will have a day off on Saturday before the Thunder darken the door of the Mother Ship on Sunday afternoon at 4:05pm. This entry was posted in Sports on October 30, 2014 by admin.